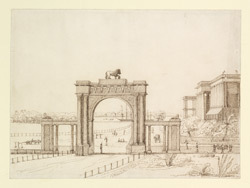 Pen and ink drawing of the south-west gateway of Government House in Calcutta by Lady Sarah Elizabeth Amherst (1801-1876) dated 1824. Lady Sarah accompanied her father Lord Amherst to India on his appointment to Governor-General in 1823. Marquis Wellesley, a previous Governor-General, had commissioned the construction of the new Government House in 1798. The architect, Captain Charles Wyatt of the Bengal Engineers, based his designs for the new building on Kedleston Hall in Derbyshire. Describing the building Lady Sarah wrote, "Southwest gateway of Government House, taken from Mama's veranda and looking down towards Chaundpal ghaut, where we first landed on our arrival at Calcutta, and where we take boat when we go by water to Barrackpore. This view is a very pretty one - ask Harriet whether she cannot conceive that in nature it may remind one of a Claude particularly when the sun is setting behind the Fort and the whole colouring clear, soft and glowing. Of the buildings, the most distant is the house of Sir Francis Macnaghten, now acting as Chief Justice. The next is the portico of the Town Hall, where all the great public dinners and public balls take place, and the nearest is the old Treasury - in the little garden which surrounds it, are some wide-leaved plants, the Banana or Plantain tree, which bears a very nice insipid fruit - you have probably heard of it among the Indian productions. The trees on the banks of the river are planted along side of a walk called the Respondentia, but it is not much frequented. We ourselves never walk even in the garden, both because it is so public and there is no time for walking, nor is it the custom, but it is a great addition to the appearance of the house - of the tout ensemble of which, I hope you have now a tolerable idea etc. etc. etc."